Say 'all-in-one system' to most AV enthusiasts and they'll recoil in horror. But the Samsung HT-C9950W is no ordinary one-box affair, it's what happens when Samsung lets its imagination run wild, blissfully free from price constraints. It's a 7.1-channel, 3D-capable home cinema system that boasts an impossibly generous feature list and, most significantly, an inventive new design. It's surprising to see the HT-C9950W deviating so dramatically from the company's trusted aesthetic of gloss black. However, the glimmering titanium finish is designed to match Samsung's high-end 3DTVs, and has more in common with the lifestyle systems of Loewe or B&O – and that's some compliment. 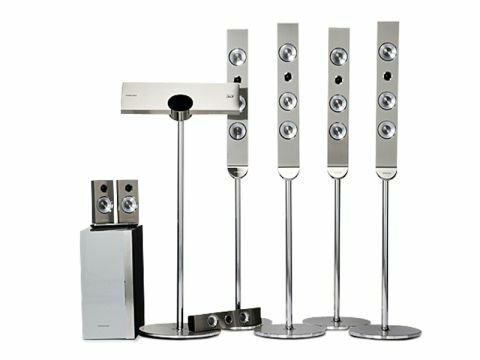 The wall-mountable main unit, which houses the Blu-ray player, stands on a long pole stand, and when powered up its black volume dial glides forward. It also doubles as a dot matrix display panel, running through an array of cute animations. Other smart touches include the side-mounted disc slot and pop-up USB port for digital media playback. Equally impressive is the speaker build quality. One-box system speakers are often hollow and lightweight, but these are more robust, and their exposed drivers and silver finish are pure eye candy. The unusual nature of the system makes it a little tricky to put together without the manual (as I had to) due to the myriad components that need screwing together. But once assembled it's a wonderfully discreet, clutter-free system; the powered subwoofer houses all the AV connections and hooks up to the player with a single cable, while the speaker wires can be hidden inside the pole stands. On the back of the sub you'll find three HDMI v1.4 sockets and an Ethernet port for BD-Live and home networking. Surprisingly, the speaker terminals are all binding posts, not spring clips. Tucked around the back of the BD player is a port specifically for the supplied Wi-Fi USB dongle. This makes it possible to wirelessly stream media from PCs and access Samsung's Internet@TV feature. The feature list doesn't stop there. Also in the box is a transmitter card and receiver box for wireless rear speakers, which would have been the ultimate in cable-free convenience had the surround back channels been afforded the same treatment. As it stands, you'll still have a pair of wires to conceal. Elsewhere there's an iPod/iPhone dock in the box, Dolby Pro Logic IIz processing, several weird DSP modes and automatic audio calibration. The system is easy to operate thanks to the delightful onscreen menus and backlit remote. It also loads most Blu-ray discs quickly, although Terminator Salvation took over a minute. Three-dimensional picture quality is excellent, issues with crosstalk on certain 3DTVs notwithstanding. Monsters Vs Aliens' image composition is spot-on, with crisply rendered objects in the foreground and superbly layered backgrounds. The pictures are vibrant and razor-sharp, even through tinted glasses. Non-3D pictures also scrub up nicely, although the Silicon Optix HQV disc reveals one or two chinks in the armour. Its greater achievement is in sound quality. The HT-C9950W manages to sidestep the problems of Samsung's cheaper all-in-one systems to deliver a more mature, refined sound. It's a genuinely powerful beast. With Iron Man 2's monaco grand Prix fight sequence, The F1 cars roar round the soundstage with real gusto, and when the sliced-up chassis crash to the floor, the noise is crisp and bracing but rarely jarring on the ears. Only the sharpest sounds at loud volumes give the speakers anything to worry about. In fact, there's some excellent high-frequency handling at play throughout the film. Inside Tony's lab, the HT-C9950W easily teases out background ambience and subtle electronic effects, giving the overall sound more intimacy than I expected. Another factor behind the system's success is the decent powered subwoofer, which adds tight, punchy bottom-end without the overpowering resonance you get from many passive bass bins. It chalks up further Brownie points with crystal clear dialogue, smooth effect steering and tight integration between the sub and sats. Combine this impressive sound quality with its other attributes and you get a stunning one-box cinema system that justifies its lofty price tag.